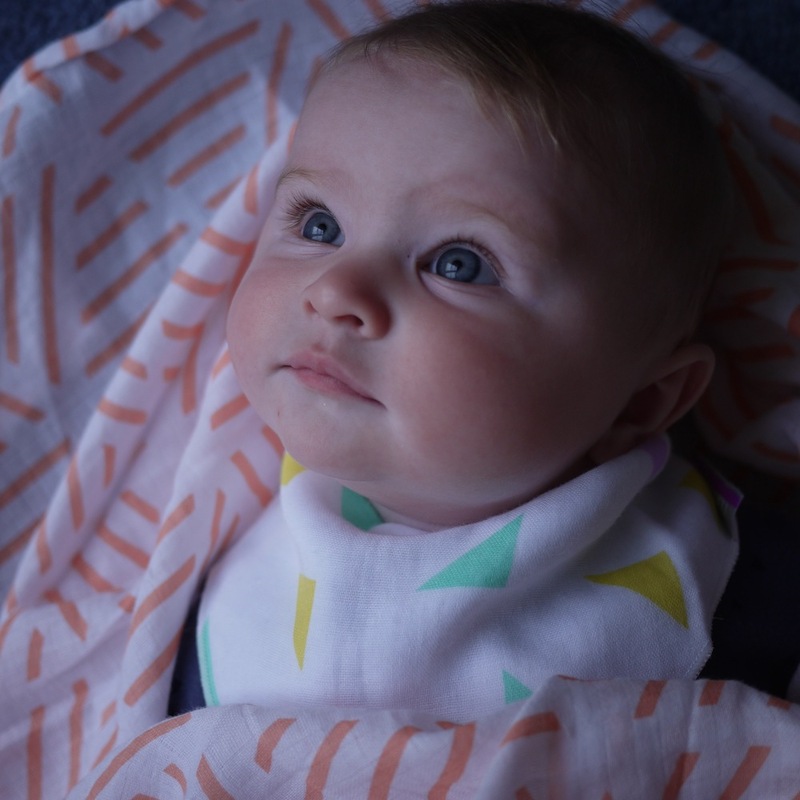 Muslins - probably the number one most useful and versatile item to invest in when you have a baby or to give someone as a new baby gift. 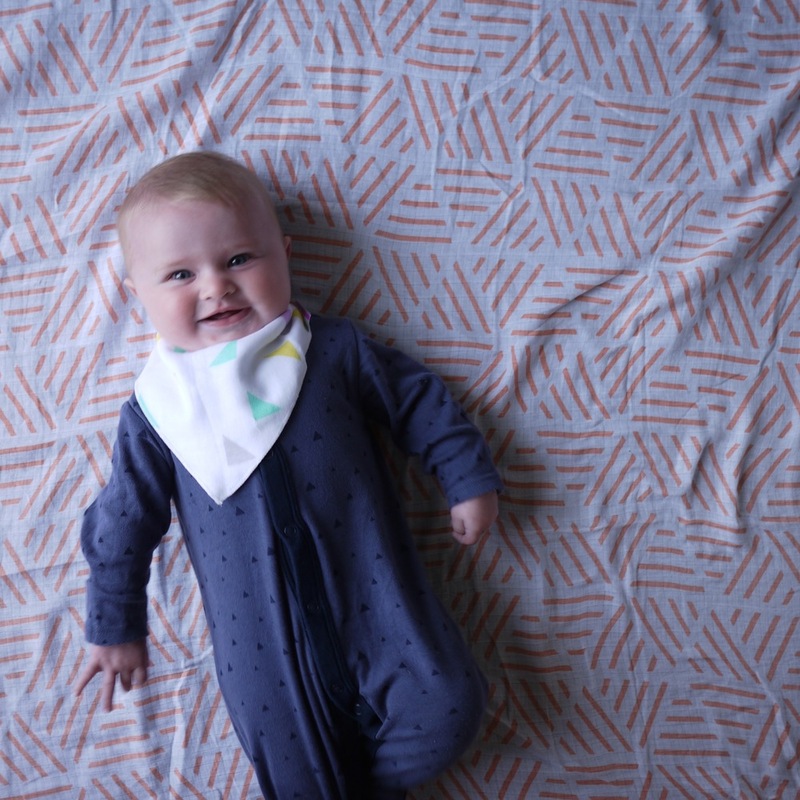 In our household they are everywhere and they are called 'babies', don't ask me why, Finn came up with it and that's just what they've always been called! Muzzies, cubbys, blankie, whatever you call them in your house you can never have enough. 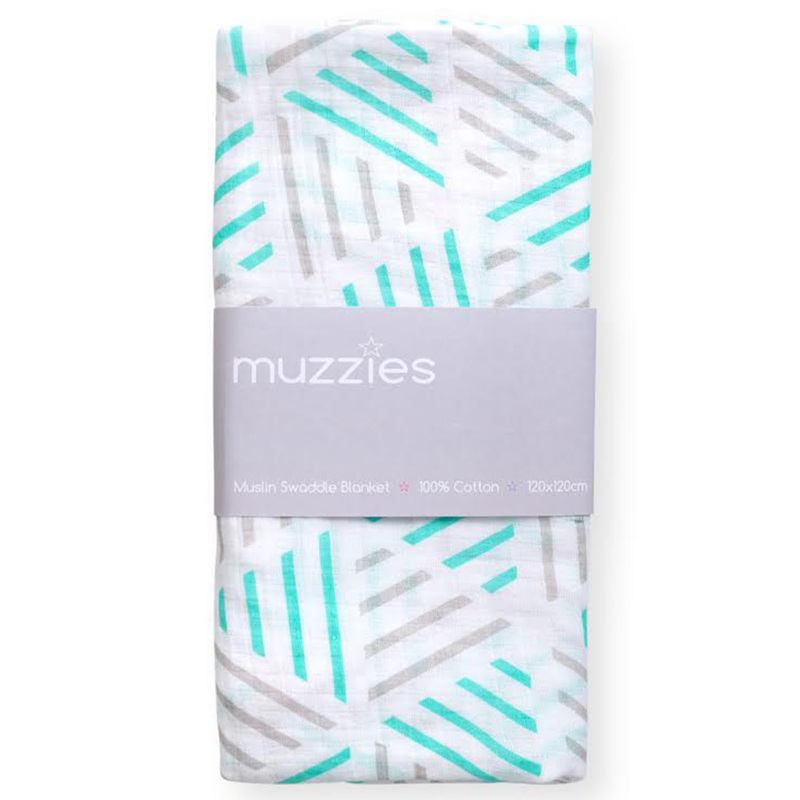 It was really nice to come across a new brand, Muzzies, who are trying to make muslins less neutral and more fun and colourful. We have always used Aden & Anais muslins and lusted after the Modern Burlap ones but have always found them to be quite colourless. 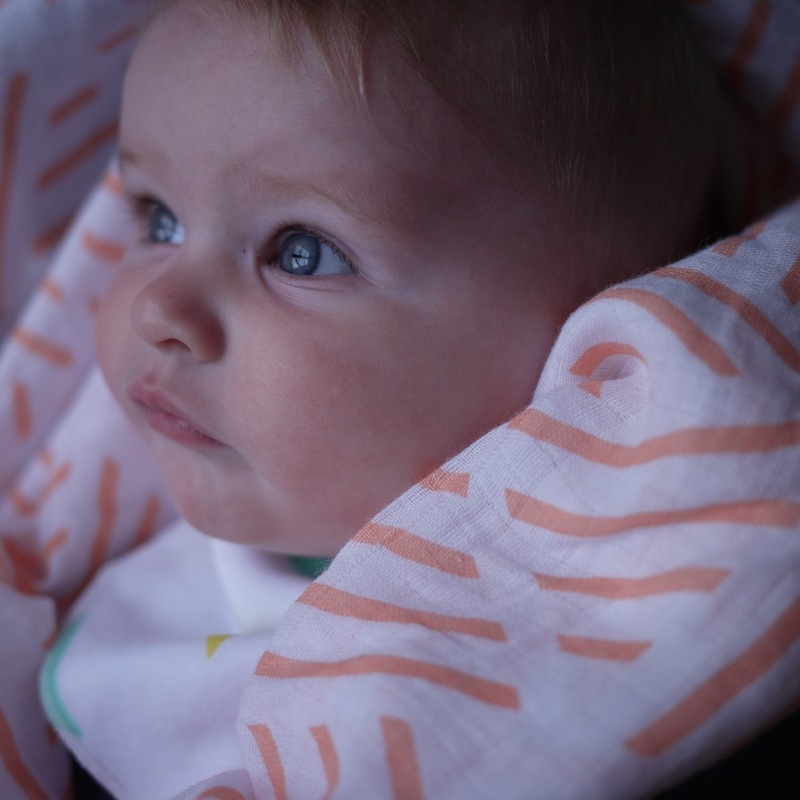 Muzzies sell muslins and dribble bibs in bright poppy colours and fun geo prints. 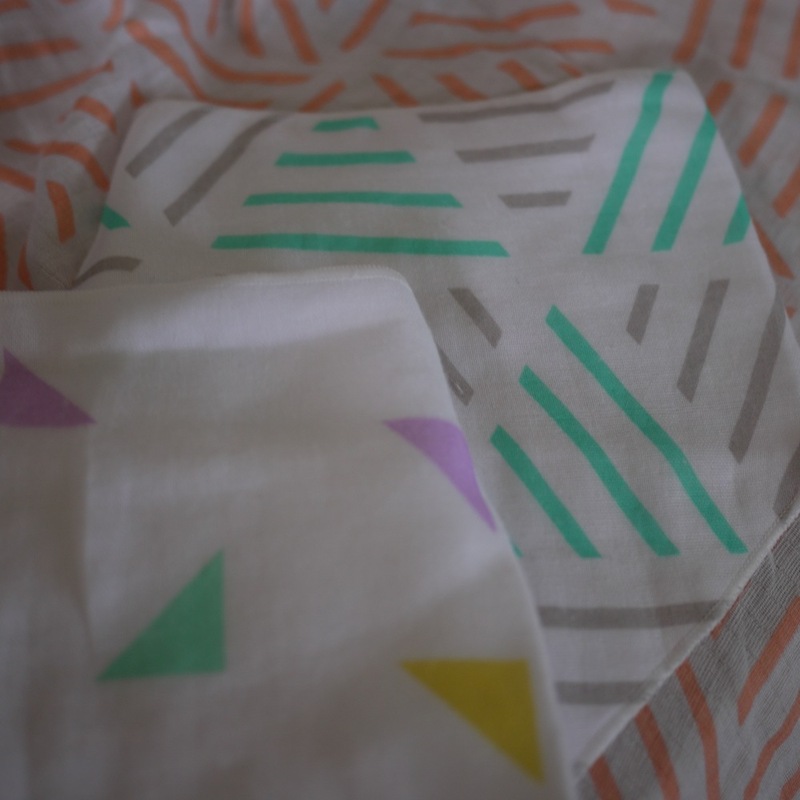 They are made of cotton, pre washed for softness (and only continue to soften down) and are playful and bold. 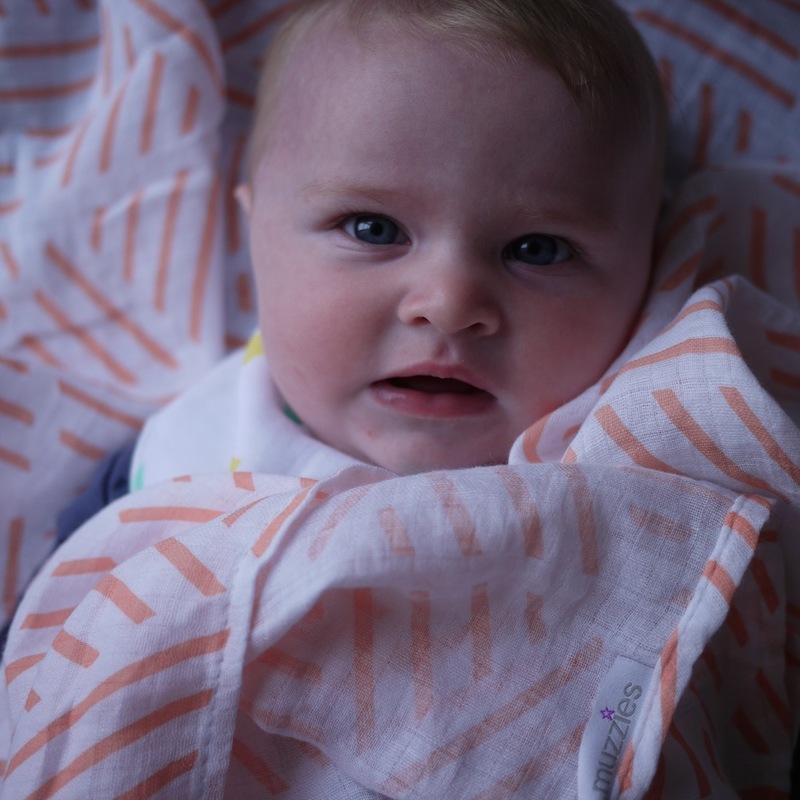 We were sent a muslin swaddle blanket and some dribble bibs to test out for this blog post. The quality is really nice and it was good to see some colour for a change! They are also reasonably priced at £12.95 for a large muslin. They are unisex and would make a perfect baby shower or new mum gift. 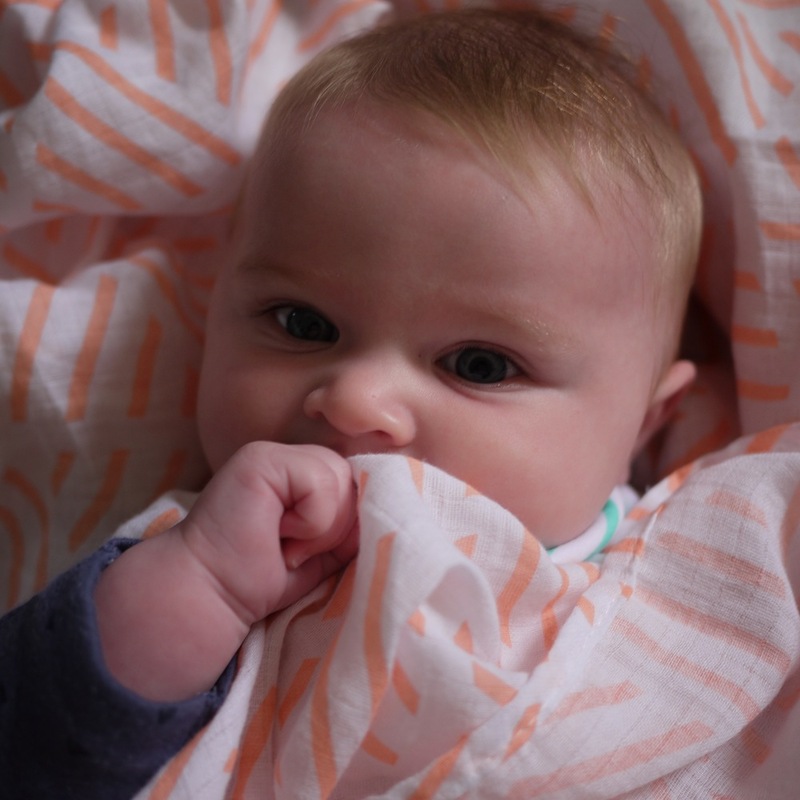 Violet uses muslins as a comforter for every sleep she has, she snuggles into one and it helps indicate nap time. 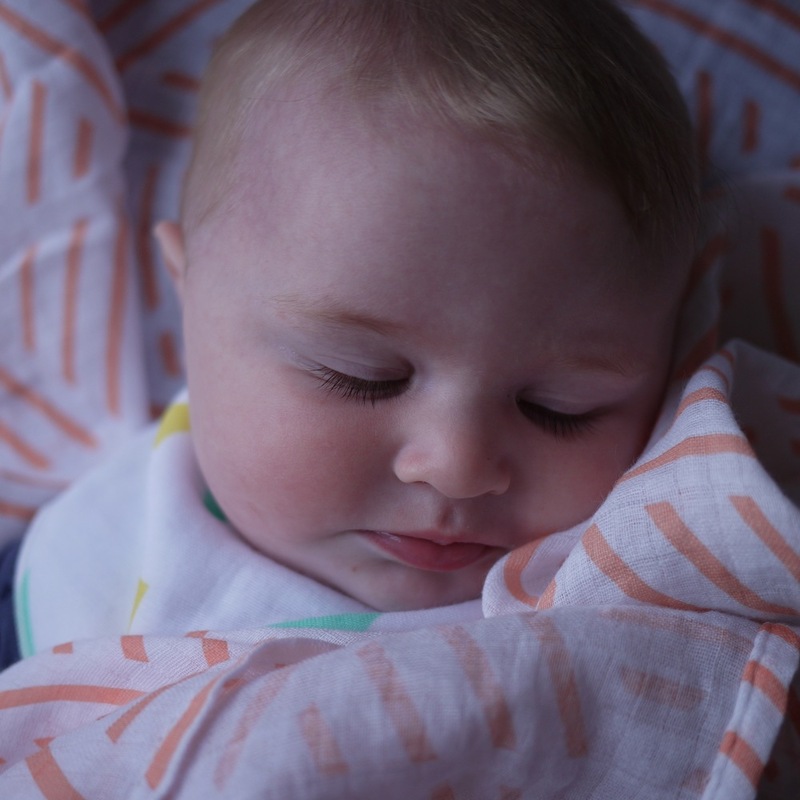 I remember when we were trying to get Finn to sleep as a baby in the early days, he was screaming in our arms and we could tell he was overtired, I gave him a muslin and almost instantly he fell asleep. Obviously we have lived by this to this day in our household! Anything to help get a child to sleep! Top tip - if you have a young baby and it's struggling to sleep give them a muzzie to snuggle into (they are breathable don't worry) and you will be surprised at the reaction to it. 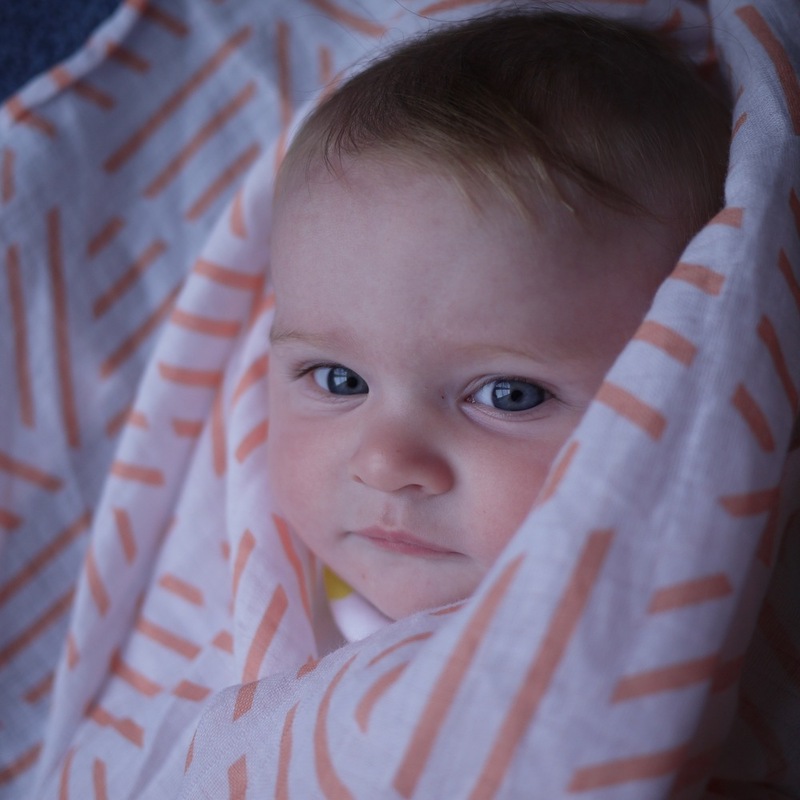 Muzzies is a new UK brand offering 100% cotton muslin swaddle blankets & bibs. The prints are unique, bright & fun. Why did you set up Muzzies? I have worked in retail as a fashion buyer for over 10 years and always wanted to design and make product for myself. When I had my eldest daughter, she became very attached to a plain white, drab looking muzzie and this inspired me. So many babies become attached to muzzies as a comfort blanket, so why not make them lovely? Why should we buy from Muzzies? I believe shopping small and local is incredibly rewarding. I have become so much more mindful of this in the last few years. I genuinely think people have become bored of the same items in all the same shops, there is no individuality on the high street anymore. So shop with us for something a bit different! As we are a small start up we only order a small amount per design so you really are buying into something unique. What's the best thing and hardest thing about being a mum? The best thing is definitely the unexpected cuddles and 'I love you's' - they can light up your day for sure. The hardest, for me personally is trying to juggling everything - full time work, running a house and everything that comes in between! As a very enthusiastic young fashion graduate I decided to move to London, about 4 hours away from my family. It's only now that I have children I feel it would be nice to be closer to them. We make it work though and still try to see each other as often as we can. How do you juggle kids and running a business? 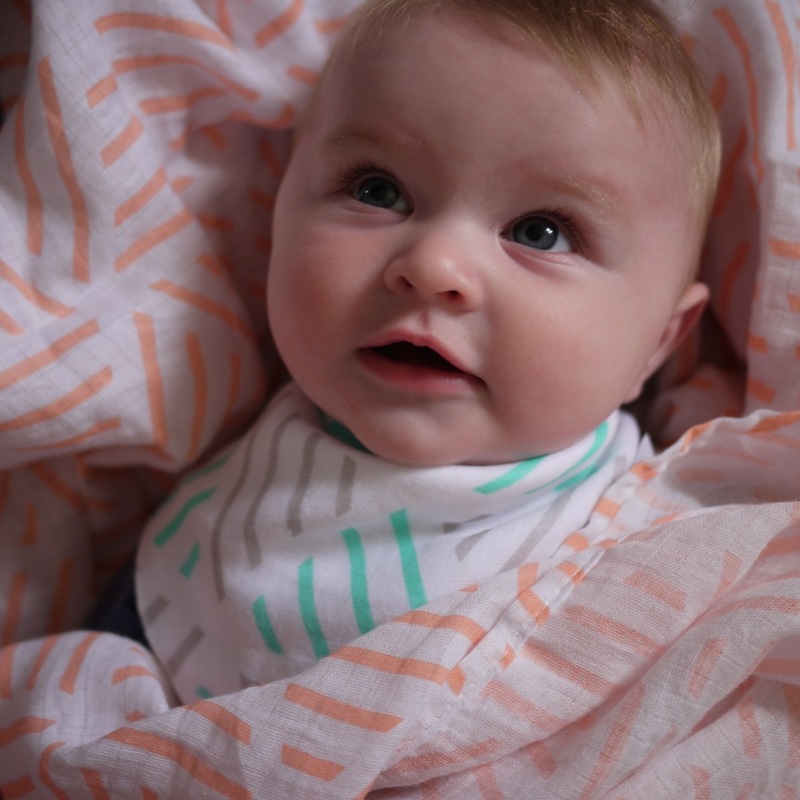 I feel very lucky that my youngest daughter Fern (5 months) sleeps pretty well during the day (night time is a different story - ha!). Nap time is work time! It's not easy and hard work sometimes but when you get such lovely comments and feedback from customers that have bought your products, its definitely worth it. What are the best baby gifts you can give a new mum? Of course I think muzzies make great gifts, but I also have to say I think it's really important to buy something for the Mum and not just the baby. I will often buy my pregnant friends a really lovely hand cream or luxury hair conditioner - no one tells you your hands go dry and your hair falls out after having the baby!! I have so many ideas for Muzzies, it's sometimes hard to prioritize what should come first! In the immediate future I would like to add more designs and expand the range. Eventually I would love it to be the go to place for Muzzies, with all sort of prints from cats & animals, stripes and geometrics to more art inspired abstract designs. 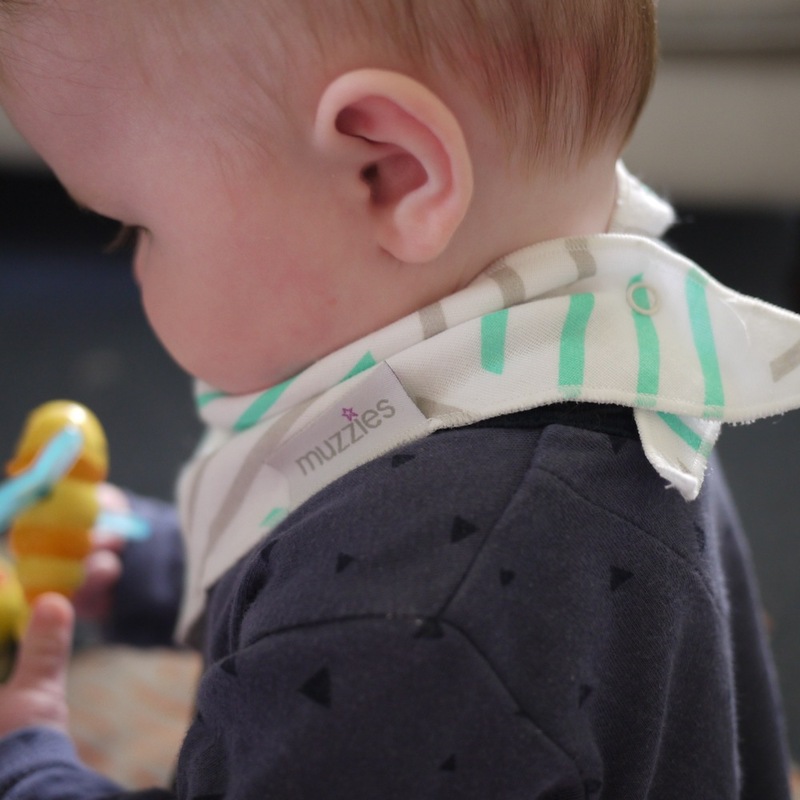 The dribble bibs from Muzzies are great too - especially now in these hotter summer days as they are soft light cotton so they don't make the baby feel like they have a heavy scarf around their neck like some other towelling backed bibs can. 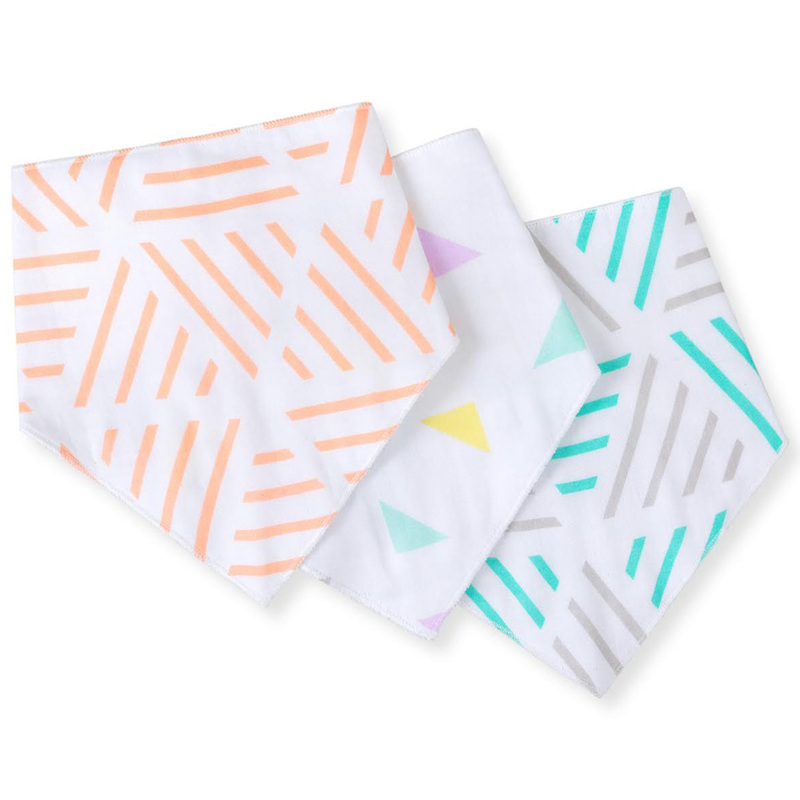 They are nice and absorbent and the colours work really well with Violet's clothes. They have two poppers at the back so it's great to have adjustable sizing for your growing baby. Support small and independent businesses! Especially those set up by mums trying to work their lives around raising a family. Finlay Fox readers will get a 20% discount and free P&P with the code FINFOX20 at checkout. Valid until 31st August. *Please note this is a sponsored blog post but all opinions expressed are my own.